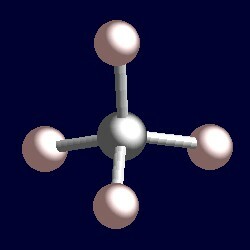 The calculation for methane shows that the carbon atom is associated with 8 electrons in the σ framework. This corresponds to four shape-determining electron pairs. The coordination geometry of carbon is consequently tetrahedral. There are four bonded groups, therefore there are no lone pairs. The geometry of methane, CH4. You can use your mouse to manipulate the molecule in the right hand "Jmol" image.